Well, that is an unproven hypothesis. From my experience, however, this is true. Ayende Rahien has found similarities to my hypothesis. Let’s extend this hypothesis – less code is better – a little bit further. The widespread assumption is that increasing the complexity of an application is bad. Why? Because lower maintainability means a slowdown in development which, as a consequence, increases the development costs. So, is it then better to keep complexity low and write more code instead? 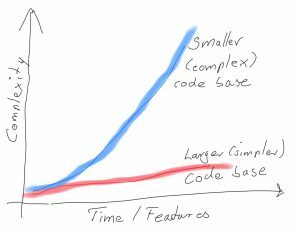 Looks like with a smaller code base the complexity tends to explode (blue). On the other hand, even with a larger code base (red), the complexity seems to stay more or less the same. As a programmer, you should always prefer readability over shortness. Why? Readability increases maintainability. 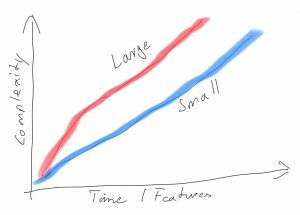 Shortness – in a very general way – frequently increases code complexity, and this decreases readability. … their benefits outweigh not using them. Shorter code is, in general, more complex, but that does not mean that it is not maintainable. A simple proof for this: When you write less code, you make fewer mistakes. How likely is it, that your teammates will ever come in contact with such magic code? If it is not likely at all, then it’s a bad idea, because others have no chance to learn this before they need to fix a bug in it. … you improve the code. Sometimes it’s better to write a lot of code over and over. Because it reflects the reality. Instead of having a general rule with lots and lots of exceptions. Or – as a second example – you would break the level of abstraction otherwise. Ok, that sounds nice, but how does that work in practice? Part 2: Destructuring and Arrow Function. How can you use that (well-known) language behaviors. Part 3: Magic Getter/Setter and Variable Function Names. Uh, uh? Self-modifying code?! Part 4: Directory indexes and TypeScript initialization shorteners. PS: It’s not lost on me that my hypothesis „the shorter, the better“ does not apply to this article, especially, when I had to split it up in four parts to increase the “readability“. Point taken, hope you enjoy it nonetheless. Dieser Eintrag wurde veröffentlicht in Development von Alex Aulbach. Permanenter Link des Eintrags.